Rebecca Birch’s voice draws the hand drawing the landscape. It tells stories of trips and meetings, people and things. 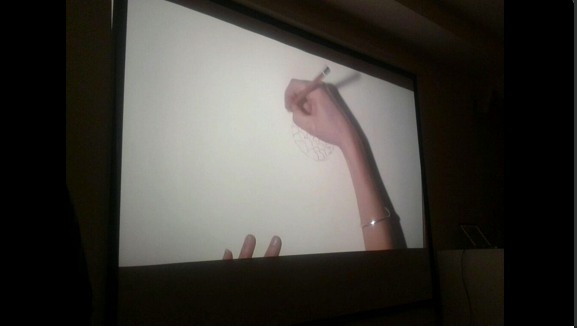 The projection of her unfolding drawing/narrating tells the story of her artwork in (auto)ethnographic style, and becomes an art performance itself. 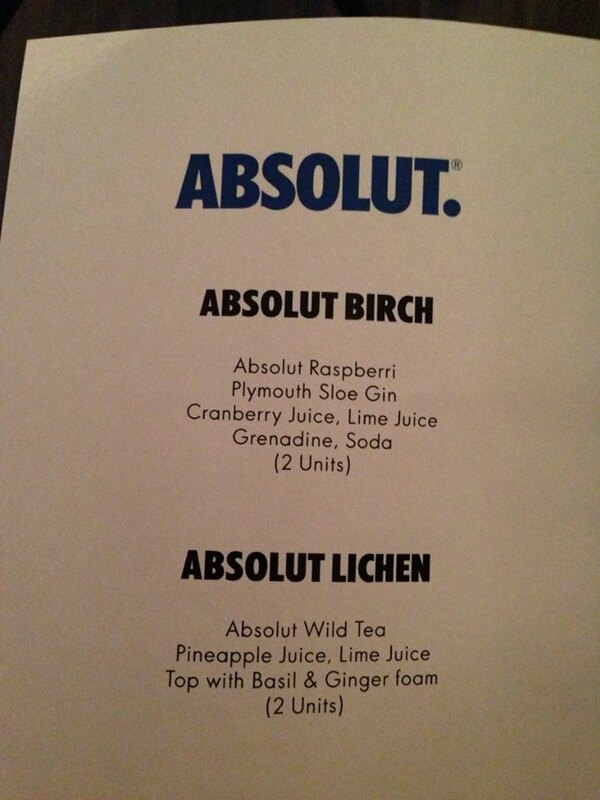 Birch’s work was recognized in Art Review’s March issue as one of the Future Greats and the magazine organised a party for her – addresses to a lichen covered stick. A lichen covered stick was part of a particular roadtrip-performance-screening -project of Birch’s, and became the theme of the evening too. I was invited to be one of the speakers – addressing this assemblage and offering variations on the theme and Birch’s art. Below a short text based on my talk, one of several talks/performances alongside Francesco Pedraglio, Erica Scourti, Karen Di Franco and a playlist provided by Bram Thomas Arnold. Imagine this talk voiced by an alter ego — a part real, part imagined Finnish lichenologist from the late 19th century, in his hallucinations of a future ecocatastrophy, and past earth times since the carboniferous era. In his short text about Rebecca Birch, Oliver Basciano gives us an image of her art works and refers to the capture of light as much as shadow through the role of the camera itself comparable to that stick covered in lichen. Indeed, the stick persists as a thematic motif; it resides there as a silent interlocutor. The closed technological environment of the car hosts both human chatter as well as this stick of nature smuggled as part of the roadtrip. The camera, the visual registers and works with light as well as lack of it – the shadow, darkness. In the context of lichen, consider another perspective too. Focus on the lichen as the first element that registers light, sound, movement, chemistry around it. It participates in Birch’s work so that it’s not only the camera, which registers the sounds and visions, but the lichen, a symbiotic organism itself. This refers to the scientific context of lichens as bioindicators – they register the changing chemical balance of the world. In short, lichen is a medium – a medium of storage, an inscription surface that slowly but meticulously and with the patience of non-human thing pays attention to the growth in air pollution. It’s symbiotic status is symbiotic in more than the biological way: it is involved in the material-aesthetic unfolding of ecologies social and nature. It was a Finn, Wilhelm Nylander, who discovered in the 1880s details about the possibilities of using lichen as biodetectors; through experiments exposing lichen to chemical elements such as iodine and hypochlorite Nylander found out that one can “read” nature through this natural element. It meant a discovery of an important feature that tells a different story; it is less a narrative than a sensory registering of the environmental change that technological culture brought about gradually since the 19th century: atmospheric pollution, leaving its silent mark. Lichen has over the years and years observed to be full of life and circuited as part of different ecologies. They have been not just objects of our attention, addressed by narratives and images but became part of the modern cycle of industrialised life. They silently observe our chatter, listen in, as well as through their earless senses know what we are doing to our surroundings. They provide housing for spiders and insects, but also some of lichens are (re)sourced as part of the high-tech industries for pharmaceuticals (antiobiotics) and cosmetics (sunscreen). This participation in multiple ecologies, a cycle of different duration is a fascinating topic considering both our theme today as well as the broader discussions of past years concerning the anthropocene. In short, it is the discussion that started in contexts of geology and environmental debate about categorising our epoch as the Anthropocene – a geological period following the Holocene and branded by the massive impact humans, agriculture, geoengineering, and in general the scientific-technological culture has had on the planet. And now, it has gathered the wider scientific and arts/humanities community as part of the discussions that reflect a different , growing perspective to the environmental. The anthropocene -and the obsceneties accelerating it as the anthrobscene – can be unfolded through lichen. In a rather important move, such Macguffins tell a hidden story of change. The technological culture in which nature becomes entangled with the human induced scientific changes. Visual, oral narratives give an image of this change. 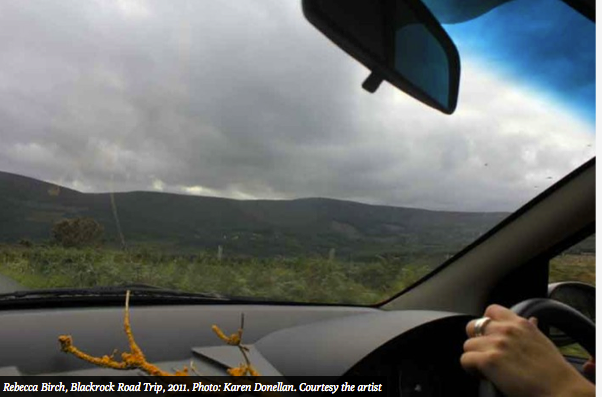 We tell stories of our nature, our interactions in ecology, in the environment with media which stores the remains of the planet as part of our human narratives- roadtrips, conversations, social events, accidental meetings, small details, landscapes – drawn by Birch in her performance that remediates the earlier. In other words, lichen is besides a conversation piece also a medium. It saves this story through its biological means as storage that in our hands becomes memory – the scientific-aesthetic context of memory read through lichen. Even pollution becomes a sort of a mediated environment, like with photochemical smog. The lichenologist Nylander was on to something, more than observations about lichen. A lichenologist plays homage to the conversations lichen shares as it tells the story of a slow change since the coal pollution (sulphur dioxide) of England since the 18th and 19th century to the contemporary air of nitrogen compounds. So besides the conversation going on in Rebecca Birch’s car, there is this silent partner always present, as it has been for a longer while, and now also articulated in the visual arts/ecology-mix of an evening – Addressing the stick, but also: the lichen as the address which receives transmissions of industrial modern culture.